There are a few staging props that really earn their keep. Home staging that knocks the socks off buyers counts on many things: curb appeal, cleanliness, perceived value, move-in-readiness. But it’s often the details that make a home memorable. That’s why I’ve compiled this list of the home decor accessories that ought to be in any home stager’s bag of tricks. Consider them your dependable details that make a difference. While a bunch of books on a bookshelf can look splotchy and distracting, a set of matched volumes looks rich, coordinated and deliberate. Generously-sized books are great, and leather bound ones are especially classy. Books used as a staging accessory let you convey a sense of who lives in the home – interesting, educated people. 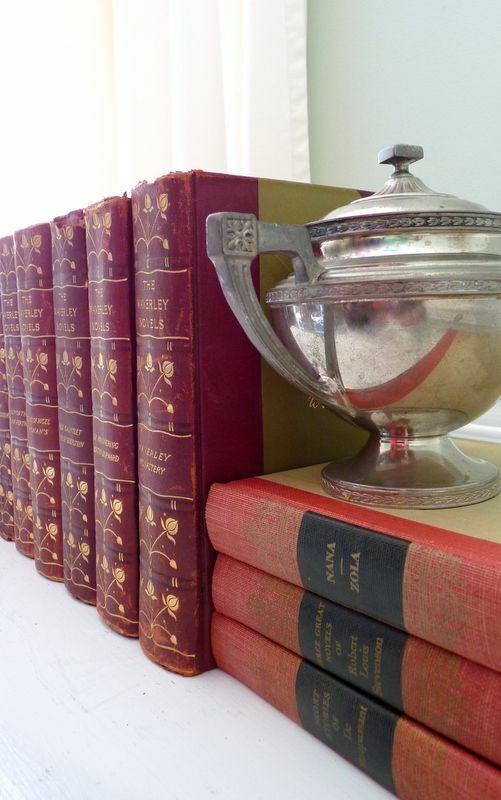 Buyers on home tours do browse book spines, so for this reason, stay away from controversial subjects or topics that aren’t mainstream (Chinese erotica, history of the occult…). Also avoid obviously dated sets like 1980’s World Book encyclopedias. But, don’t put out anything valuable or irreplaceable, either. One trick stagers use is to cover mismatched books with matching paper bookjackets. I've used white shelf paper, gift wrap, scrapbook papers, and even newspaper to disguise book titles. Best source of stage-worthy volumes is at a local library sale. I recently helped sort books at my library’s annual sale and was surprised at the quality and selection of books – all topics and colors, just what a stager needs. I love seeing a glass bowl of lemons on a kitchen countertop or island. Whether you use a ceramic platter, a wooden bowl or a wicker basket -- the pretty effect is the same. Think of lemons as the default dining room centerpiece, the perfect prop for completing a staged beverage bar of glassware, or the easiest way to dress up a foyer tabletop. 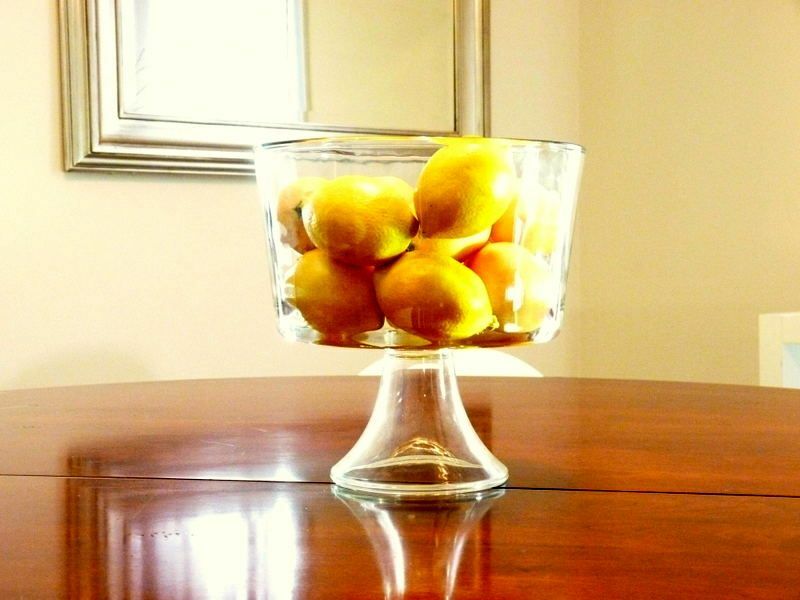 There are couple reasons why I rate lemons high for home staging. One is that nobody is tempted to try and eat them the way they would apples or pears. They’re clearly decorative. The other reason is that lemons represent freshness. They’re tangy and fragrant, and even if you’re staging with fake lemons, the message is the same: clean and fresh. The only thing that adds more life to a room is plants. But I'm keeping my list to six! All these lemons are fake. Who's to know? Yellow lemons seem to compliment any color scheme. New towels are a must for dressing up a bath. Face it -- towels age and although they work just fine for everyday use, when you’re aiming for that luxurious, boutique hotel look, you want fat and fluffy new ones. I always suggest white ones unless the entire bathroom is white. White towels will always work in someone's next home. Although not every stager will agree, I don’t have a problem with tying decorative ribbon or cording around a towel, to let people on a home tour know that they aren’t to be used, especially if it is open house day. This prop might be a tad more difficult to locate and afford, but the results are dynamic. A landscape painting literally opens up a room. The most economical sources are the usual second hand places we all love (eBay, thrift stores, garage sales), but you can also buy budget-friendly new artwork that works fine. Or you can create DIY art suitable for staging. Your landscape could be a beach, forest, city, mountain or rural scene. 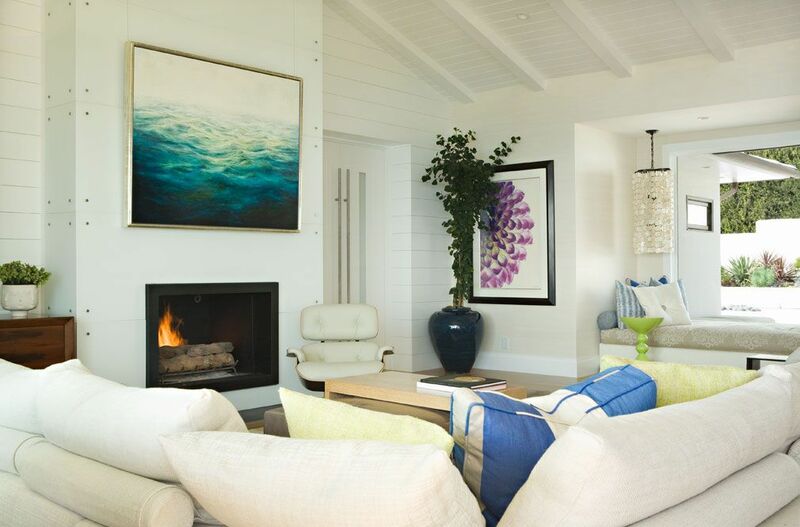 Make it match the mood of the home -- abstract watercolor you create yourself, one of your own photos blown up big and framed, a kitschy paint-by-numbers scene, a colorful travel poster, or a sophisticated black and white photograph. Buy frugally and plan to spend more on the framing than on the art, because the framing is what puts art over the top. A landscape this large becomes the focal point of the room. Nothing wrong with that! include images of land. Seascapes are "landscapes." Photo: Bonesteel Taylor Hall. how important a set of tables lamps are for a balanced look. 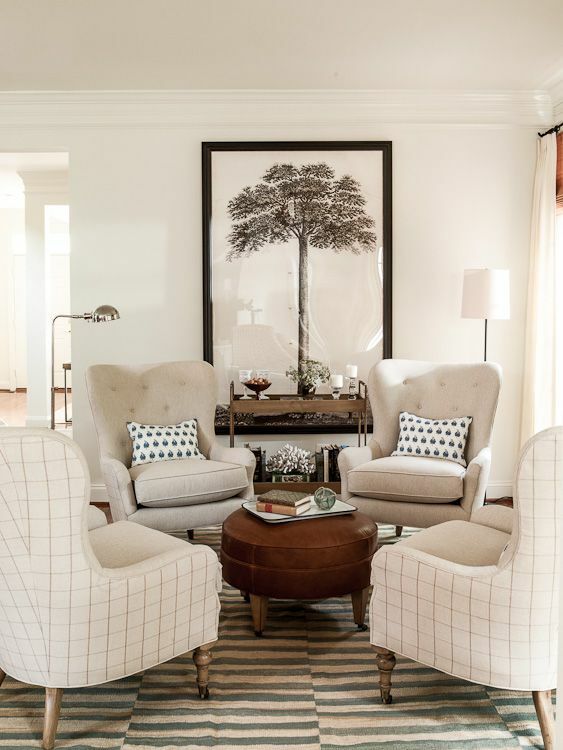 If you tour showhouses and study photos of professionally designed rooms, you’ll notice how often the savvy decorators who plan these rooms use pairs of lamps. Anytime a pair of anything is used as a decorating prop, there’s a sense of order and quality. Rooms done on a shoestring from castoffs lack the cohesiveness that twosomes add to a space. Although you might be home staging on a shoestring, the last thing you want is to look like money’s a problem. That's an important point to remember! Buyers' perceptions of your financial situation will influence the purchase price they offer you. Write that down! Look wealthy. Look generous. Look comfortable. Don't look needy or you'll attract "bottom feeders." 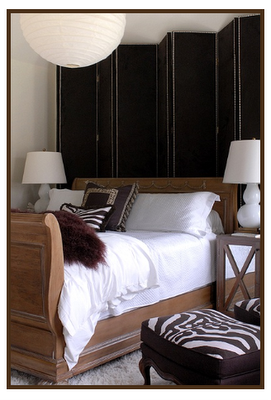 A pair of table lamps in the bedroom or living room will help you pull off mismatched nightstands or side tables. Don’t approximate this look by using two lamps that resemble each other; they must be identical twins. The lamps should be placed close enough so that they are both visible in a glance, such as on either side of a couch or bed. Their shades should match, and they should both be on the same level. Walk through the home to make sure you haven’t separated a matched pair of lamps, and then reunite them for staging. matched pillows puts a finishing touch on the grouping. Pillows are one of the absolute best ways to add another layer to a room’s decor. I recommend pillows in colors that flow seamlessly with the color scheme of the room rather than oft-touted pops of color. You can still have fun with geometrics, textural fabrics, dressmaker details, and animal prints. What to avoid: Cute sayings on pillows, pillows flattened by age, stiff pillows that don’t look comfortable, and an excess of pillows on any bed, sofa or chair. If you make your pillow insert slightly larger than the pillow cover, you'll have a nice, plump pillow. Pillows add the custom details that give a room some interest and make a room look finished. They also suggest hominess and comfort. How does your staged home rate for having these essential decorating props? None of them are break-the-bank investments, yet they will all add value to your home and make it more inviting to people shopping for a new home. If you like these tips, check out my home staging eBooks. They’re written to help you get a better price for any home on the market. At $4.99, they’re great investments. Guaranteed!